So far the count is 57. I thought I would give a summary of the better places I have visited so far. As you know, the top score at the moment is 7. I don’t think there would be a better place then this. The key factor though with all of these places though, is that the places have been rated on Coffee, and Coffee alone. Nothing to do with the food, ambience, service or location. It would be no point to travel to some of these places if you are looking for a good place to get together with a few friends. i.e. The Cup of Truth. Good Coffee,but nowhere to sit. I have been very biased towards 65 Degrees. However, all of the places are good. I could recommend a few places to get together. Proud Mary, St Ali, Las Chicas, Studio Movida all are good places to eat and get together for good coffee. 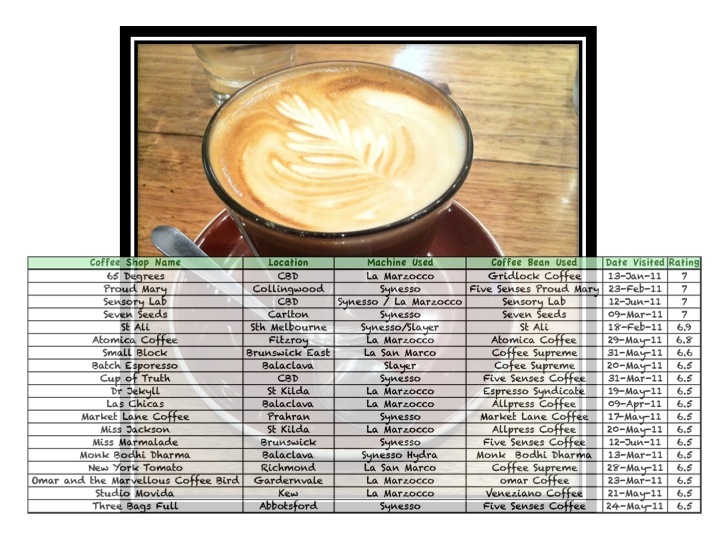 Hope you find the time to enjoy some of the good coffee’s available around Melbourne.